I would like to invite you to the opening of the Trans Trash Exhibition this Friday 30th September 2011 at 8.00pm. The aim of this project is to make waste cycles transparent to the public in an attempt to enable more personal social awareness and responsibility. 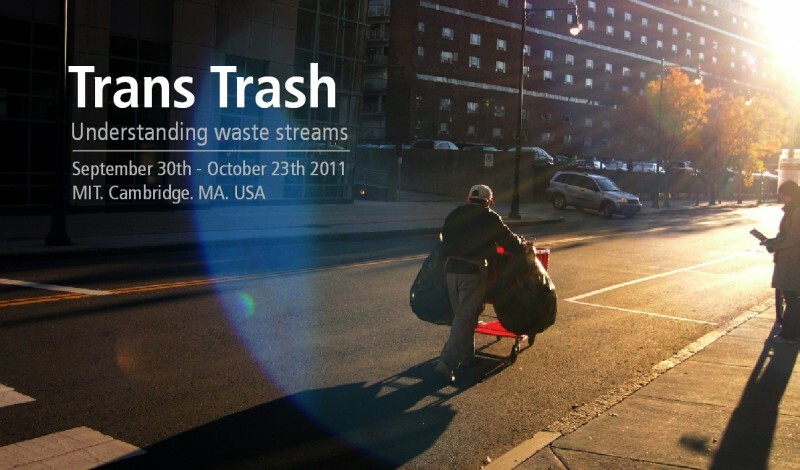 Using Cambridge, MA, as a region of focus, and MIT as a hyper-local example, the works in the exhibition display information about local waste and the overlaps or tensions between the informal and formal waste management sectors. It is our belief that the local scale is fundamental in enabling the opportunity to reflect on global waste processes. The exhibition showcases projects with varying approaches and formats, from local to national scale. Ultimately, the exhibit has both a physical and an on-line presence. Exhibition’s opening is scheduled for September 30th, 2011 at 8pm. Refreshments will be served. Where: Room 408. Building 7. MIT. Mass Av Cambridge. MA. USA. Dates: September 30th – October 23rd 2011. Download posters in pdf: one, set of posters. Trans Trash is a collaborative exhibition that brings together staff, faculty, visiting researchers and students and makes the MIT community sensitive to the subject of waste by raising awarenes and encouraging small local changes in the ways individuals treat garbage in their individual lives. The exhibit will then be open for 3 weeks. Nancy Kim. Master of Architecture Candidate. MIT. Libby McDonald. Community Innovators Lab’s Green Hub Global Program Associate. MIT. Dietmar Offenhuber. Research Fellow. Senseable City Lab. PhD Candidate. MIT. Pablo Rey. Basurama Boston. Co-founder of Basurama and Visiting Scientist at Center for Civic Media. MIT Medialab.